There is no class during public holiday and most of the stores are usually closed. Vacation period starts in the evening of the indicated day. School starts on the morning of the indicated day. Theoretical classes at HEAR are taught by specialised faculty members. These classes nourish the students’ entire curriculum, allowing them to situate and maintain a critical distance with their artistic productions. These classes offer a varied approach in historical, thematic, transversal contents and in disciplines ranging from semiotics, aesthetics, history of modern and contemporary art, just like specific History based on mediums (photography, graphics, design, typography…). Most of the classes are taught in French only. However some theory teachers are fluent in English and accept essays to be written in English. Classes in English can be found in every department. Some teachers follow the student’s work during Rendez-vous invididuels (individual appointments). These are not English classes but moments for students to acquire technical, practical and theoretical knowledge in their specific fields of work in English, giving their work an opening to international opportunities. Students also get to experience different teaching methods used around the world, most of these focused on openness, co-teaching and collaborations, allowing students to gain the necessary self-knowledge and confidence to share their work and ideas with ease and enthusiasm. In a trusting and non-judging environment, all communication happens in English, regardless of ability or level. Most classes at HEAR are held in French. Improving your French skills will allow you to make the most of your study period at HEAR and your stay in France in general. Although French language classes are offered to our international students during the semester, we still strongly recommend a good preparation before your arrival. French classes are mandatory for all international non francophone Music students, regardless of their level, and for Visual Arts students whose level is estimated at B1 and below on the CEFR scale. Tests and classes will take place in the CLAM language center. A mandatory test of French proficiency level will take place at the beginning of each semester. The class focuses on everyday life communication and is based on practical situations. This class also offers a specific support for Music and Visual Arts students with dedicated time related to arts training. From understanding French contracts, to writing a French CV, a Master thesis, a work statement, or preparing for the bilan (final presentation), the teacher will help you develop your language skills, and offer adequate tools related to your own field. The Hors Limites week changes the school’s daily routine. The usual schedule is stopped and is replaced by workshops. The detailed program will be published on the school’s website. In order to register, please contact the scolarité (Academic Affairs office) of your campus. Deadline: end of October. During one week events around International student and staff mobility will happen in both the Mulhouse and Strasbourg Visual Arts Campus. Students and teachers having gone abroad during the 2015–16 Academic year will present their experience through oral presentations and an exhibition. As foreign students we will ask you to present your schools, cities and countries to the other students at HEAR. There will also be presentations on how to apply for artistic residencies abroad and how to organize artistic projects internationally. 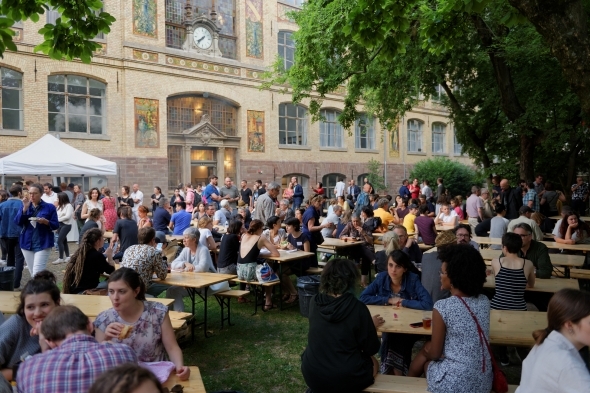 Tranches de Quai is an evening event at the Mulhouse Visual Arts Campus with exhibitions and performances presenting the results of a week of workshops as well as the works of invited artists. Open school Day in Mulhouse, January During the open school day, you will be able to meet teachers and students who can tell you all about studying at HEAR and how to apply. The Diploma Show allows you to discover the work of students that have graduated on the Master level at HEAR. 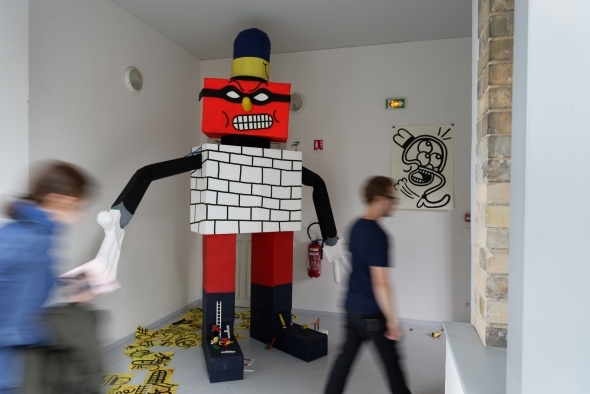 During two days, an overview of the work – Art, Communication, Design, Music, Scenography is presented to the public on the Strasbourg Visual Arts campus and at the Académie supérieure de musique. Technical workshops are accessible beyond regular class time. During the whole process an assistant will help you through the realisation of your project. Among the technical workshops in Strasbourg Visual Arts Campus, 6 of them form the Cursus PIF initiation programme. The PIF (Prépresse Impression Façonnage) initiation aims at showing students the whole process of a graphic chain. The initiation is a prerequisite in order to access each of the 6 technical workshops but places are limited. Students will need to have an edition project in mind before registering. Find more information in the Cursus PIF brochure. If you study within the Art-Object department, teachers may schedule specific initiations which will allow you to access the facilities of another specialisation. If you’re not an Art-Objet student, please check with the coordinators of each specialisation for the possibility to follow an initiation.